FoCo Café is the first nonprofit restaurant in Fort Collins, Colorado. The unique feature of FoCo Café lies in the fact that patrons themselves manage the restaurant in a pay-what-you-can setting. A donation box replaces the cash register at the café counter, encouraging patrons to pay what they wish. Those who come empty-handed get to participate in the community tasks in exchange for a meal at the café. FoCo started operation on Thanksgiving Day in 2014 with the generosity of a community that wanted to provide healthy food access to everyone. The café runs several donation programs within the community. The café is funded by the donations of patrons and features a daily menu that consists of small batches of food made from locally grown, fresh ingredients. FoCo Café operates 6 days a week, Monday through Saturday from 11:00am to 2:00pm and remains closed on Sundays. · Salads - Cucumber salad, white bean tuna salad, salad with apple, red onion in a Dijon vinaigrette on greens, and quinoa pilaf with salmon, greens, and mushrooms. 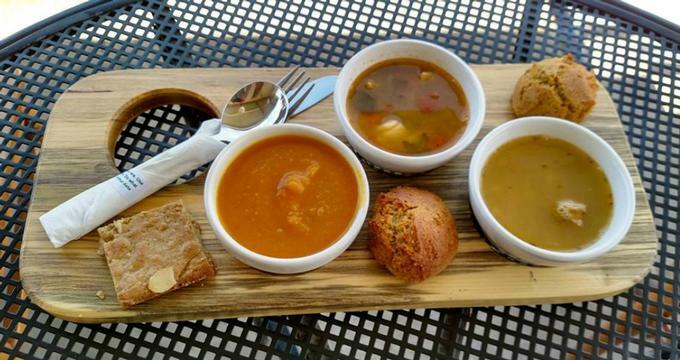 · Soups - Cowboy chili, white bean chicken chili, cream of broccoli soup, gluten-free salmon soup, gluten-free cabbage and pastrami borscht, vegan and gluten-free Brazilian black bean, tortellini and greens with sausage. · Breads & Desserts - Gluten free non-GMO corn muffin, almond cake, and The Waffle Lab bread pudding. · Summer Breakfast - FoCo Café’s hosts a Summer Breakfast Program that provides healthy breakfast throughout the summer to low-income families and children. The children and their families also get to be a part of the community by participating in educational activities and caring for the café's garden space. The program serves breakfast Wednesday through Friday from 9:00am to 10:00am. Following the breakfast, FoCo's summer interns lead participants in activities that last up until 10:30am. Although not mandatory, preregistration is preferred to be a part of this summer program. · The FoCo Freedge - The FoCo Freedge program aims at reducing food waste by securing excess food to feed those who are hungry. FoCo successfully raised funds to purchase an energy-efficient refrigerator for public utility. Citizens and restaurants are encouraged to drop off excess produce at the unit so that someone else can put it to a good use. The café invites donations in the form of paying monthly electricity bills for the refrigerator. · The Giving Tree - The idea of the Giving Tree originated from a video on the “Wall of Kindness” movement that started in Iran. FoCo Café aims at catering to the need of its community by channelizing resources from those who can afford it to those who need it the most. The Giving Tree at FoCo Café restocks daily utility items like wet wipes, tissues, journals and pens, individually wrapped snacks, toothbrushes, toothpaste, baby powder, toiletries, hygiene products, and more with the help of donors.